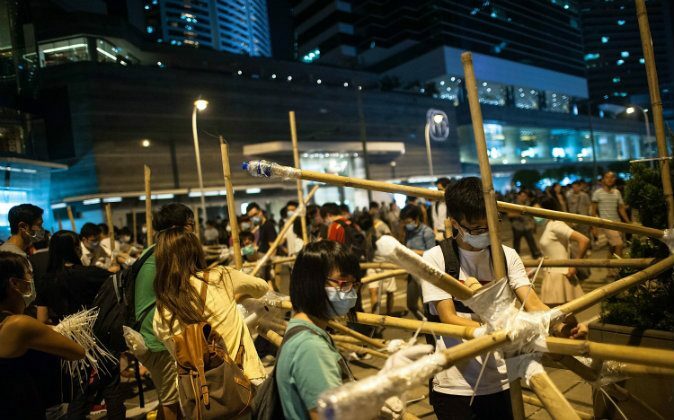 HONG KONG—The occupation of key parts of downtown Hong Kong escalated on Monday, after protesters erected sturdy roadblocks made of bamboo, chains, industrial sticky tape, concrete, and city rubbish bins pushed into service as joints. Protesters said the action was in direct response to the assault on the area by a group of individuals that were widely suspected of coordinating with the government and police. They may have had a better chance of clearing the area last night, though. At about 3:30 a.m. there were less than a dozen young people at one of the lightly put-together roadblocks consisting of loose traffic signs and metal police barricades. Most of those present were slumbering in their tents, while Stephen Lam, 28, and Phillip Cheung, 23, stood guard. They had been hunkered there for the last week and weren’t planning on going anywhere. “We’ll stay until the end, whatever that is,” said Cheung, with a towel tied around his head. The authorities will be forced to use a backhoe to remove what has now been built in place of the sleepy roadblock. Many of the participants, including those fresh from their jobs in the city, seemed genuinely frustrated at what they perceived to be a “trick” by the government to remove their barricades. A man in brown brogues and a surgical mask who declined to provide his name said that he had come in response to the group of men that arrived earlier in the day and dismantled several of the structures. At about 1:30 p.m. dozens of men had arrived abruptly and begun cutting plastic ties with garden snips and harshly yanking away the grated metal barriers that have been used to block roads for a week and a half. The attack came of a sudden in an otherwise quiet day in the occupied area around Admiralty, where Hong Kong’s government offices are located. Student groups later blamed the government of working with triads to launch the attack, since the timing seemed to accord with the official timeline to restore traffic to some of the occupied roads. There is no evidence to confirm that the men were paid by or coordinated their actions with the government, but many of those milling about and helping build the barricades on Monday spoke of it as though it were common knowledge. “In my opinion I think it was arranged by 689,” said one protester who did not wish to give his name or provide identifying information. The term “689” is a disparaging term of address used to refer to Hong Kong’s chief executive—689 because that is how many votes he received in order to become the head of the city. His remark was also typical of the new atmosphere on Monday night: amidst the urgent, frantic pace of building barricades, many more protesters wore masks covering their mouths, part of an attempt to obscure their identity, and a shift from the original tactics of the Occupy Central with Love and Peace movement. The movement much earlier had formed a consensus about no use of masks, so as to demonstrate to the public that protesters were happy to be identified with the movement. Also different was the fact that the majority of the roughly 15 people who spoke to a reporter declined to be identified, or fully identified. “I think they were paid by pro-Beijing parties,” said Ms. Chan, who is in publishing and in her early 30s. “It’s just logical.” She pointed to the timing and their apparent coordination. Police spokesperson Steve Hui identified the men who launched the action as “a large group of protesters together with representatives of the logistic industry and taxi drivers.” They focused their efforts on the road known as Queensway, which for the last week has been almost empty, but which usually shuttles thousands of vehicles an hour. The statement did not address the accusations of student groups that the police had foreknowledge of the action, but Hui was asked by a reporter if there had been any collusion. Hui responded that “The police are not soft on taking on the triads,” then elaborated the various anti-triad programs run by the police. He said three men between the ages of 18 and 47 were arrested. Queensway had until the attack been sparsely occupied by the students. Most of the occupiers energy and action has previously been devoted to what they recently renamed “”Umbrella Square,” effectively the 12-lane Harcourt and Connaught Roads, which go through the heart of downtown. On Friday student leaders called for protesters to begin bringing in tents and permanently stationing themselves on that roadway, to settle in for the fall as discussion—or lack of—with the government creaks along. On Sunday there had been a disagreement among the students about bargaining away Queensway in exchange for the space that is known as Civic Square (but identified by Director of Administration Kitty Choi as “the East Wing forecourt of the Central Government Offices”). The government made clear that no bargaining of the sort would be in the offing. By the evening of Monday, protesters had not only rebuilt the barricades that had been taken away by assailants and the police, but were in the process of erecting the large and elaborate bamboo structures.